Come in and get comfy. Check back often as we continue to add news about your schoolmates, teachers and your alma mater. Find out when your reunion will be. Laugh while reading and looking at photos. Feel good about the successes of fellow alums. 1 - Your Annual Support/Dues: Click here for support form to print and mail, OR online by logging in (see log in box at top) then clicking on your name to go to your profile. 2 - Or make a one-time DONATION. They received their awards on Homecoming weekend, September 28, 2018. ARE YOU VISITING FOR THE FIRST TIME? DO WE HAVE YOUR EMAIL? IF 'YES' LOG IN ABOVE using the email we have on file for you, click on forgot password and continue on. with your email address so it can be added to your data entry. It's worth the extra effort to get connected! 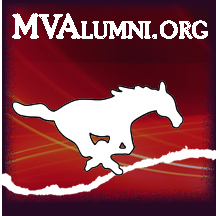 ALUM OR FRIEND -- NEVER BEEN IN OUR DATABASE? Email the Alumni Association. Read past issues of the Alumni Newsletter here. Enjoy these memories of Mount Vernon downtown and high school years as shared by the class of 1968. The Alumni Association was formed to coordinate all-alumni activities. Donations to the Alumni Association are used to support the alumni newsletter, data base, awards and Association activities. The Foundation is a charitable non-profit organization that partners with alumni, businesses, parents, and friends to help support a higher level of educational excellence for students of Mount Vernon Schools.